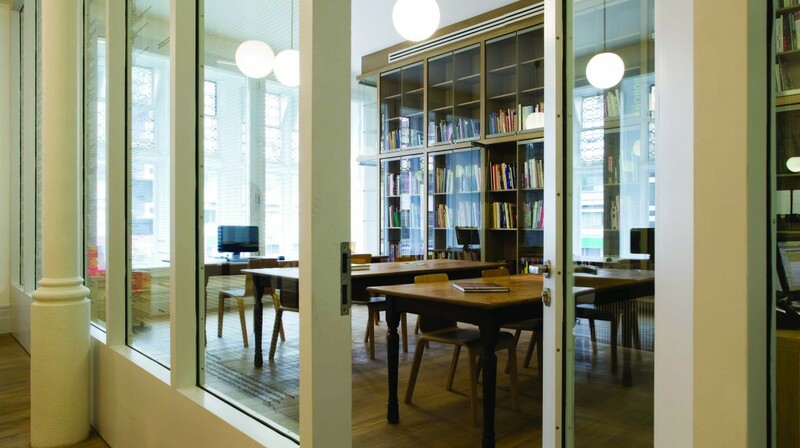 The Foyle Reading Room is the Whitechapel Gallery’s dedicated space for research. It is open to all members of the public. Located on the first floor next to the Pat Matthews Gallery (Gallery 4), the Foyle Reading Room offers public access the Whitechapel Gallery Archive and Library Collection. The Library Collection, partly displayed in the Reading Room, holds a growing selection of publications relating to artists who have exhibited at the Gallery over the years. The Foyle Reading Room also houses all past Whitechapel Gallery exhibition catalogues and publications including the Documents of Contemporary Art anthology series (published by Whitechapel Gallery and MIT Press). Items are for reference only. Computers are available to use for consulting the Archive collections and other online material. The facilities allow researchers to bring laptop computers and use free WIFI connection. Viewing facilities for audio-visual materials are available. Photographs are not allowed but photocopies of archive material may be obtained for research use only, depending on copyright restrictions and condition. Scans may also be requested. Cost is dependent on intended use. To book a visit to the archive or if you have an enquiry, please download, complete and email the Archive Enquiry Form. Find out more about using the Whitechapel Gallery Archive here.